When I ask managers about their greatest sources of joy and suffering in the business, they often give me the same answer to the two questions: the others! Their greatest joys are for example when they collectively win a new client, brainstorm as a team about the future of their business, attract great talent. Their greatest suffering can come from the betrayal of a partner, disappointments with employees, conflicts with customers. Their relationships with others, whether they are associates, investors, customers, employees or partners, are numerous and intense. And sometimes, some relationships turn into conflicts and generate stress and suffering for all parties. How to try and improve the situation? I just read a fascinating and clear book called “Victim, savior or persecutor, how to get out of the trap” from Christel Petitcollin. Its content is useful to improve relationships with others in the personal and professional context. The author begins by explaining that we all have a vital need for recognition, which we seek to satisfy by multiplying human contacts. A healthy way to interact with others is to try to obtain that recognition positively. First welcoming this need inside us, then expressing it clearly and finally getting what we asked for, or not. Experienced entrepreneurs I meet call transparency this type of interaction. This is the behaviour they recommend with partners or employees. Do not bury problems, share them as clearly and calmly as possible and try to find a solution together. The victim: Pure and innocent, the victim is passive and helpless. He is surrounded and harassed by persecutors that he holds responsible for all his misfortune. He is plaintive and pitiful and can also be blundering and exasparating. The persecutor: He is filled with frustration, which he is trying to evacuate at the expense of a victim weaker than him. He is critical and demeaning, hurtful and cruel, threatening or violent. 2 people in conflict can take turns taking the role of persecutor and victim. 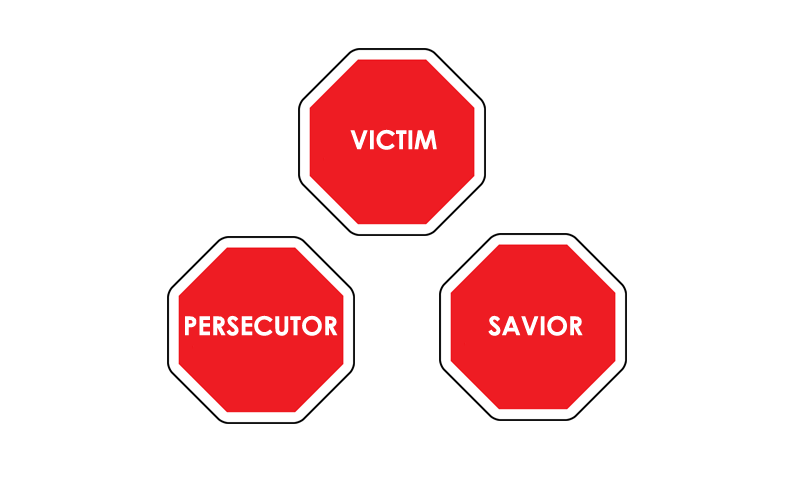 A victim that is injured can then become a persecutor and so on, starting a vicious circle. The savior : Kind and generous, the savior infantilises his interlocutors by giving assistance when it is not requested. To exercise his power, He also needs victims. Strong, altruistic and protective, he can make people feel guilty. If you can picture these 3 postures, I invite you to reflect on the roles that you tend to play and also to think about the past unpleasant interactions you had so you can identify the roles of your interlocutors. To start the game, one of the two participants has to launch “bait” to the other in order to drive him into it. This can be a lament for a victim, a provocation for a persecutor or guilt for a savior. I also invite you to identify these baits. And from here, what can we do to avoid the trap and negative and frustrating interactions ? If I play the victim: I have to realize that the solutions to my problems are inside me, I replace my complaints by specific requests, I realize that there is no persecutor without a willing victim. I progressively develop my autonomy and my confidence. If I play the persecutor: I must try to understand the origins of my frustrations and realize that the others do not have to suffer for it. I develop a spirit of tolerance. I realize that what I criticize in the others is what I forbid myself. I become aware of the limits I set for me and I can try to allow myslef to be who I am. If I am a savior : I have to try to find other ways to feed my ego. I realize that what I believe to be assistance can make the other dependent. If I want to help someone, I can do it by favoring listening and facilitating his access to autonomy. If I am in front of a persecutor: I can only be hurt if I accept it, I do not strike him back because he is not ready to hear it. I focus on his transgression which I do not accept. I assert myself quietly by compelling him calmly but firmly to respect me. If I am in front of a savior: I refuse to be considered a victim and I refuse the assistance he offers me. However, I thank him for his proposal. Detecting when a “game” arises and refusing to play seems to be the key to restore a healthy relationship with others, a relationship of simplicity and transparency. Of course, conflicts and differences may remain due to fundamental disagreements but avoiding the infernal triangle of victim, persecutor and savior, can save a lot of energy, avoid much stress and boost self-esteem. Without playing, the relationships are more direct and allow a true encounter with the other. I can finally assert myself and consider the other as he is by listening to him more carefully. But to achieve this, I must make efforts by being more vigilant, developing self-consciousness and consciousness of the others and working on myself. And it is difficult, because if I stop hiding behind a character that I play, I will have to face situations without being able to escape; confronting myself first, then the other. I cannot run away and I have to decide, accept the other’s request or refuse. Although it may seem uncomfortable and scary, stop playing is a great opportunity for us to try to become who we really are.